“…I am not accepting any other MC but you!” Anita Mathews – Executive Director, The Sports Trust. 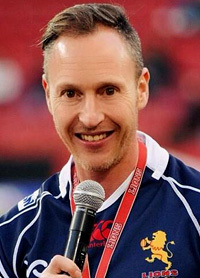 With almost two decades MC’ing experience, from his long-running role as Ellis Park Stadium announcer and Lion’s MC to blue-chip corporate events, Rick Alan is able to connect with his audience and keep any event seamless, entertaining, enlightening and interactive From MC’ing and facilitating to carefully researched panel discussions and dynamic team building. Rick Alan is no ordinary MC. He honed his skills while designing and MC’ing promotions for the major Southern African casinos and is now known as both an artist and producer. Rick has worked with numerous organisations and utilises his degree in marketing to consult on campaigns as well as heading up The ProduXion House. Rick Alan has also proven himself at the highest international level. All of this has made him one of the country’s most experienced and sought after MC’s. If you wanting to book Corporate Entertainment - We have South Africa`s TOP Artists. Hire a Comedian, Master of Ceremonies, Live Bands, Dance Acts - You can even Hire a Magician - We have the very BEST in Live Entertainment for your function or event.